This red oak double door entry is simply breathtaking. Framed by crystal panels and a glassy archway, the doors seem to stand alone. Three-paneled mission doors are known for the rich stains that help bring out the natural, opened grain pattern you can almost touch. Wide, slightly raised panels divide the doors into areas of interest, with subtle colors throughout the wood. Oak doors hold their stains exceptionally well and are naturally resistant to pests from their high amounts of tannic acid. 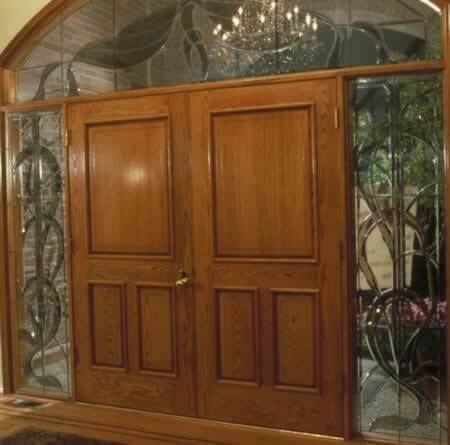 Realty studies show that having a distinctive from door not only lends curb appeal but increases the value of your home. Oak has long been a symbol or endurance and strength, and the tree is the National Tree of the United States. When you want to create a powerful impression, turn to the mighty oak.